Until one morning when Sterling Saucier’s older brother Phineas runs into the swamp . . . When he kisses me, there is no world beneath my feet. There's only Heath's hands on m arms, his lips on mine,and the vibrant taste of peaches.The kiss is different from the others. It's fast and bruising, one diving headlong into the next, stirring a wildness in me I've never felt. It's hungry and substantial, and all the things I didn't know I wanted to say to Heath. This kiss is a confession. It's no secret, ours s the meanest swamp in Louisiana. People don't just disappear. Not like this. Not from our memories. If they did, we'd have all forgotten Dad. Mama wouldn't hate the smell of whiskey. I wouldn't sleep with the window open. And Phineas wouldn't know how to be angry. Secrets are never so dangerous as when they've been fogotten. Fear doesn't protect anyone. Fear only makes us more vulnerable when we should be finding ways to be strong. 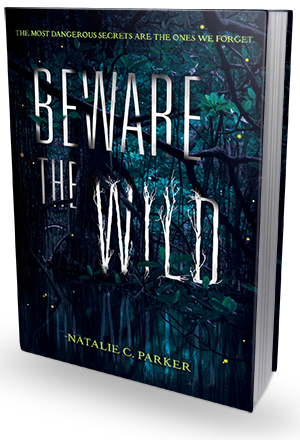 In all honesty, Beware The Wild was so much better than I thought it would be and so very different from what I initially assumed it would be about. It's not so much a horror story, as it is a beautifully drawn gothic fantasy with elements of horror and supernatural. It's so rich and flavorful, so thick and layered, so sensual and atmospheric and full of southern charm and magic, it's a fabulous read through and through. An exquisite tale of madness and despair, love and loss, the evil, the lost and the cursed. I went into it expecting a scary read. A creepy swamp story that would send chills down my spine. And you know what's? In a way it did. There are scenes in this book that are genuinely chilling, or, at the very least, deeply unsettling. Parker's stunningly vivid visuals help make these scenes even scarier, and also kind of poetic. But, for the most part, this book was just so.. profoundly beautiful, sad, mesmerizing and sentimental (in a good way). And so damn evocative of everything southern, you could almost taste the murky swamp water on your tongue and feel the humidity sticking to your skin like a layer of damp clothing. Above all, this book was also charged with powerful feelings of love, longing, desire to protect, regret and heartbreak. And, because there are no simple truths in this story and instead of blacks and whites we get a world painted in the shades of gray, it was also a profoundly moving and undeniably sad read. I finished and I wanted to feel happy for those who won and got free, but instead I felt deflated and sad for those who lost. And you can't really understand it until you read the book for yourself, but just know that this story really pulled at my heart strings and hit me hard in all the soft spots. I was not a big fan of the romance at first. In fact, I prayed for it not to happen. I thought it would make the story worse, that it would weigh it down with unnecessary teenage drama or cheesy pick-up lines and too many awkward kisses. In one of my goodreads progress updates I even wrote that I love the atmosphere and the eeriness of the story but I am hoping for it to be romance-free. Well, I take it back. I take it all back right now! I was dead wrong, because you know what? The romance was really well done. It was tasteful, not rushed, sweet and exciting, but also heart pounding and moving. The dialogues were meaningful and sparkling with amazing chemistry (though to be fair, all the dialogues were like that, not just the ones involving Saucier and Heath), the love-birds already had a backstory, so their relationship felt more genuine and grounded (as opposed to silly insta-loves), and, most importantly, they took time falling for each other and you could tell it was more than just physical attraction, which was really kind of refreshing and awesome. Bottom line is, the romance didn't take away from the story, quite the opposite, it added a whole new layer of emotions and intensity. The plot was really well thought out and captivating. It's an intense read; it resembles a ride through the Rocky Mountains, in that the tension goes up and then it goes down, just so it can go up again. The slower moments are all meaningful, they are there for a reason - setting the mood, introducing you to the characters and their back stories and telling you more about the swamp itself and all the crazy stories related to it. And then there are those high-intensity events - Phin's disappearance and the arrival of Lenora May, Saucier being chased through the swamp by a beast, all the situations involving Fisher, and, finally, the mind-blowing confrontation in the final chapters - these are all blood-pressure risers and adrenaline shots, and they're all extremely well executed. I fell under the spell of this story and it held me captive until the very end. I could not resist its charm and seductive allure. I think fans of Brenna Yovanoff and Genevieve Tucholke will really like this book, especially if you're into heartfelt gothic stories set against vivid southern backdrops.